This study of Msgr. Reynold Hillenbrand is an extraordinary examination of the liturgical reform movement and its impact on the Second Vatican Council. Although a pioneer in the U.S. Liturgical Reform Movement, only a small number of Hillenbrand’s writings have been published. This book is the first published study that makes full use of Msgr. Hillenbrand’s personal papers. Interviews with those who worked with Hillenbrand also give insight into how he promoted a vision of social renewal rooted in and leading back to the celebration of Catholic liturgy. "Father Robert Tuzik's book Reynold Hillenbrand: The Reform of the Sacred Liturgy and the Call to Social Action studies the life of one of the most dedicated liturgical reformers. As rector of a major seminary and later as a pastor, Reynold Hillenbrand stressed the connection between liturgy, life and social action. Father Tuzik captures well the irony of Hillenbrand's life as a liturgical leader of the 1940s and '50s and his later struggle with the developing theological visions which emerged in the years following Vatican II. Many of Hillenbrand's ideas have relevance today and Father Tuzik's work presents them in a thoughtful and objective study." 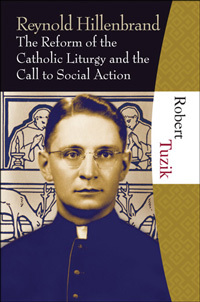 "In Reynold Hillenbrand: The Reform of Catholic Liturgy and the Call to Social Action, Robert Tuzik provides a much-needed insight into the life and teachings of an American liturgical reformer who deserves to be better known. As Father Tuzik reveals, Hillenbrand's long view of the Sacred Liturgy and desire to stay near the heart of the Church's teaching authority have proven prophetic in the age of Benedict XVI's notions of continuity and reform. Hillenbrand never saw reform as an end in itself or a means to give the liturgy entertainment value. His ultimate goal was the transformation of souls through the grace of Christ properly received in the liturgy, which would then flow out into the world in a reconstruction of a just social order. Promoters of social justice as well as those interested in Pope Benedict's liturgical renewal must read this book to understand how the Sacred Liturgy, the font of grace, can once again lead to a holistic understanding of the Church as Mystical Body." Curator of the exhibit "Reynold Hillenbrand and the Sacred Liturgy"
Robert Tuzik is a priest of the Archdiocese of Chicago. He holds an STL from the University of St. Mary of the Lake, and a PhD in Liturgical Studies from the University of Notre Dame. He has been an associate pastor of five parishes in Chicago and is currently Special Projects Coordinator for the Office of Divine Worship of the Archdiocese of Chicago. He also serves as a liturgical consultant to his Emminence Cardinal Francis George. He has served as a special consultant to ICEL and the BCL and is a member of the Society for Catholic Liturgy and Region VII of the FDLC. He has served as an adjunct professor of liturgy at the University of St. Mary of the Lake and as a Lecturer at Loyola University of Chicago. He has published numerous articles in Rite, Liturgical Ministry, Modern Liturgy, Assembly and Antiphon.